When SEO professionals discuss universal site navigation, they tend to pay more attention to the technical side of the matter. You may hear from them advice such as: “Ensure that there are internal links to each of your website’s pages”, or “Make sure you don’t have too many navigation links on a single page because you’ll end up with too many internal links” etc. However, there is another aspect that should not be left out at any cost and that is the users. The navigation should be user friendly, too, and not confuse the site visitors. Web designers are often stranded in the task of constructing the most suitable site navigation for optimal performance in search engines, but which is also comfortable and easy for the visitors to use. Here, we have tried to gather a few tips on how to approach the universal site navigation for the best search engine results, but without excluding the human factor – the visitors. In this post we will focus mainly on the universal navigation and how to build it in an optimal way. Whenever a visitor lands on your site, you would want them to be able to figure out your navigation system quickly. Most of the websites use a strip with the navigation categories (the main website sections) at the top of each page and this strip does not change throughout the pages – it stays constant. 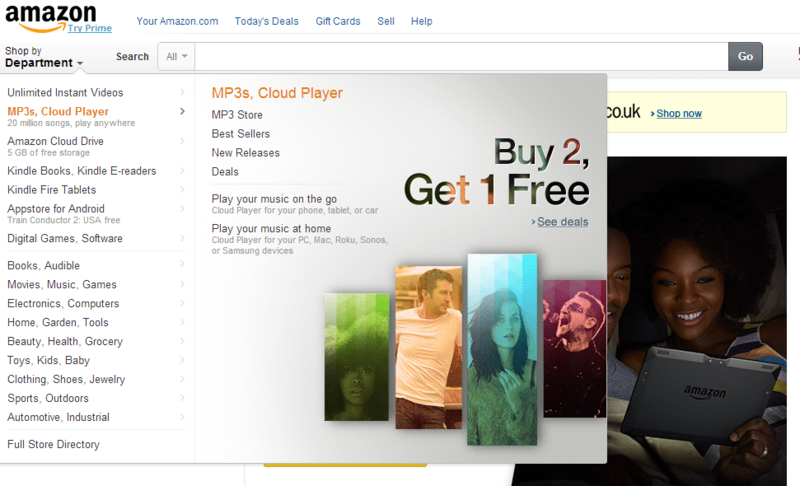 On some websites, this strip is placed on the left side (like Amazon, for example). The way search engines see your site, through this navigation strip it appears that each page on the website is linked to those main sections or categories. Internal linking plays its part in showing the significance of the different website pages to the search engines. Thus, the pages that are featured on the universal site navigation will have a better ranking than those that are placed lower in the navigational hierarchy. In this line of thought, web developers often commit the mistake of structuring the universal site navigation in the form of a table of contents – they use just a few general categories in the universal navigation, like Products, Location and Contact, and list the other sections as sub categories. However, this limits the scope of internal linking and contradicts the ground rule: Each link in the universal navigation must have a backlink from each page on the site. These links should be pointed to the most important and highest level pages. If we take the site of Amazon as an example again, the categories featured on their universal navigation are linked to Amazon’s top departments. There are a few steps you must go through when structuring your website’s universal navigation. These will ensure that the navigation is optimized not only for the search engines, but for user-friendliness as well. Step 1: Identify the purposes, for which people would visit your website. Although you may already have an idea of what visitors look for on your site, you can get a clearer insight by examining your web analytics. What keywords do your incoming visitors use prior to getting to your site? Track what pages on your site they visited – were they able to find what they were searching for? Once on your site, what search terms do visitors use in the internal website search? Do you have pages for these categories? Statistics show that only an average of 10% of all visitors use the internal site search. The low percentage can be an indication that the visitors can get around your navigation pretty well, as we can assume that they use the site search only when they can’t see the desired category in the navigation. Which of your web pages receive the largest traffic? In case these pages are the ones you want most traffic directed to, you should make them easy to find in the navigation. If, on the other hand, these are pages with lower conversion rates, what similar pages can you direct these visitors to instead? Determine your top exit pages. In case these are external contact info or locations, there is a high chance that a large part of your visitors will be looking for these and you should add them to your universal navigation. Step 2: Categorize your key pages/products. You can use a simple method to do that. Write your products down on cards and lay them out so that you can see them all. Then group similar ones into clusters to form categories. Follow the logic. Also, do not forget that one product may fall under several different categories. Step 3: Name your categories. Use a keyword tool like the Google AdWords Keyword Tool or any other you may prefer to determine the popularity of your categories. Search for these keywords through SEOmoz’s toolbar. This allows you to take a look at the competition. Try to strike a balance between popularity and competition of the keywords and voila – you have your categories. Step 4: Use the categories you have come up with in your site’s universal navigation. If you use navigation at the top of your site, the thumb rule is to use seven links/categories at the maximum. In case you choose to position your navigation on the left side, you can use a bigger number of categories, but do not go over twenty, as this is going to be distracting for the visitors. If we look at our example again, Amazon has sixteen categories. These are just a few ground rules and tips for building your universal site navigation. In our next post, we will examine more details of the optimal search engine friendly navigation. Stay tuned!